Grow your career with a leading UK manufacturer. We’re a British commercial boiler manufacturer with our head office in Poole, Dorset and factory in Hull. We have a strong British heritage that dates back 100 years, as well as an enviable reputation for developing market leading products. We continue to push the boundaries of design in order to manufacture products for the future of the commercial heating and hot water industry. But it’s the people behind the products that are at the heart of our business. Simply put, we love doing what we do. Roles available in our head office in Poole including finance, marketing, and customer service. There’s also a team of sales and service engineers across the UK. We are a part of Groupe Atlantic, a French-owned pan European international heating and hot water products manufacturer with over 7,000 employees. Job vacancies are listed on this page, but to see opportunities as they arise and get a feel for what it’s like to work here follow us on Twitter, Facebook, and LinkedIn. Before applying for any vacancies, please read our job applicant privacy notice and employee privacy notice. For more information and to apply for a job at Hamworthy Heating please send your CV, covering letter and salary expectations. Please include the job title in the subject line. 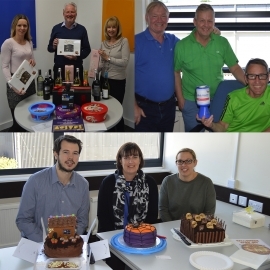 See how we support our community with fundraising and volunteering.